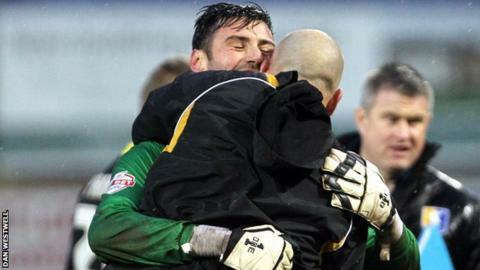 Mansfield keeper Scott Shearer saved two penalties as they survived a scare to seal three points against Morecambe. Morecambe went ahead early on through Kevin Ellison's low finish before Matty Blair levelled with a deflected shot. Krystian Pearce headed the Stags ahead from Mal Bennings' corner but Shearer saved Shaun Miller's penalty when Ryan Tafazolli fouled Andy Fleming. Shearer was the hero again in the second half as he saved Paul Mullin's spot-kick when Jack Thomas handled. Match ends, Mansfield Town 2, Morecambe 1. Second Half ends, Mansfield Town 2, Morecambe 1. Adam Dugdale (Morecambe) wins a free kick on the right wing. Attempt missed. Kevin Ellison (Morecambe) header from the left side of the six yard box is just a bit too high. Penalty saved! Paul Mullin (Morecambe) fails to capitalise on this great opportunity, right footed shot saved in the centre of the goal. Penalty conceded by Jack Thomas (Mansfield Town) with a hand ball in the penalty area. Substitution, Mansfield Town. Reggie Lambe replaces Chris Beardsley. Attempt missed. Chris Beardsley (Mansfield Town) right footed shot from the right side of the box is just a bit too high. Corner, Morecambe. Conceded by Krystian Pearce. Attempt missed. James Baxendale (Mansfield Town) right footed shot from outside the box is close, but misses to the right. Substitution, Mansfield Town. Jack Thomas replaces Craig Westcarr. Attempt saved. Malvind Benning (Mansfield Town) left footed shot from long range on the right is saved in the centre of the goal. Craig Westcarr (Mansfield Town) wins a free kick on the right wing.